On Friday, November 12th from 10:00am to 2:00pm, Rural Action is sponsoring a Project Learning Tree (PLT) workshop at the Wayne National Forest Headquarters between Athens and Nelsonville. PLT is designed to assist educators, both formal and non-formal, to deliver hands on, inquiry-based lessons that focus on environmental topics. This PLT workshop will cover the Forests of the World module of PLT, which emphasizes forest ecosystems, connections between forests and people, and also engenders critical thinking skills. This module is designed specifically for secondary education, but is also applicable to Middle School and post-secondary levels. In a region where forests are among our greatest assets, the PLT- Forests of the World module assists educators in utilizing this resource. Space is limited. 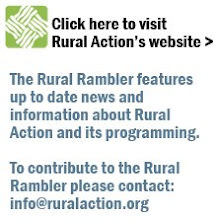 Please contact Joe Brehm to register at joe@ruralaction.org or via phone at (740) 767-2225. Light refreshments will be provided.